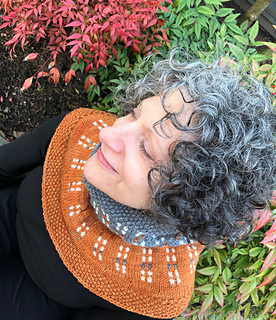 The Homage Cowl is a delightful and easy first color stranding project. Slightly shaped to stay beautifully on the shoulders, this cowl is a flattering addition to your stay-warm wardrobe. 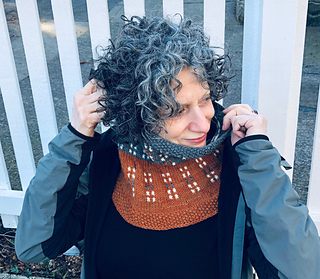 By using the same colors together in different proportions, the top and bottom areas of the cowl reveal interesting and surprising things about color relationships. Please continue the experiment I have begun. Three colors yield endless fascination and opportunities for play. 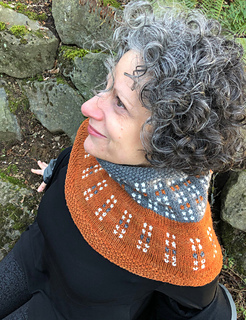 I hope you enjoy this little exercise, and this darling cowl too! This cowl is written in one size, wearable by most. I used three colors of Abundant Earth Verdant, a small fiber mill in the Pacific Northwest that specializes in beautiful small batch yarns. The orange color was created by overdyeing Light Gray Verdant with Abundant Earth Fiber’s Wool Tincture in Pumpkin #221.